BOWLING GREEN, O.H. 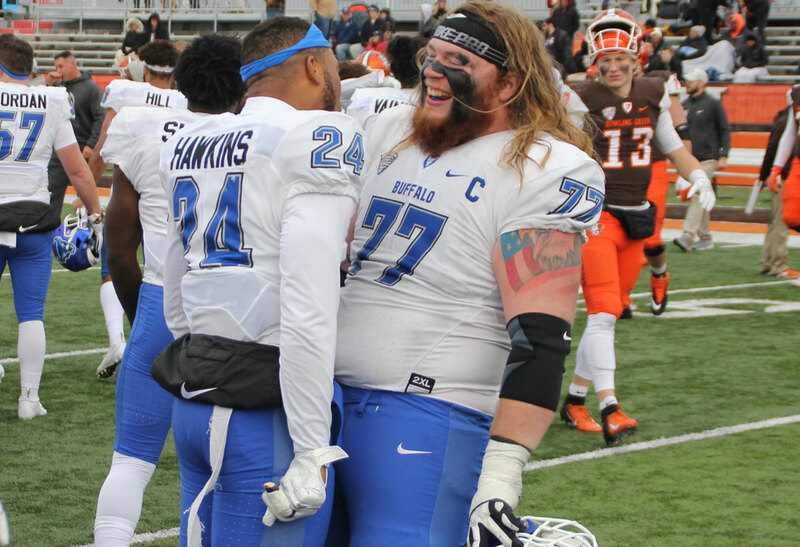 -- For the second time in school history, the University at Buffalo football team will play for the Mid-American Conference Championship after defeating Bowling Green, 44-14, at Doyt Perry Stadium on Friday afternoon. The Bulls won the MAC East title and will advance to Detroit to face Northern Illinois next Friday. Buffalo (10-2, 7-1 MAC) dominated the line of scrimmage and, behind the blocking of their offense line, rushed for 332 yards and four touchdowns in the game. Jaret Patterson set the tone early with 88 yards and two touchdowns on only 11 carries. He opened the scoring with a 40-yard touchdown run. The freshman running back added an 11-yard TD in the second quarter. Kevin Marks also scored on touchdown runs of one and three yards and finished with 63 yards in the game. Buffalo's leading rusher was Emmanuel Reed who had a game-high 109 yards on only 15 carries. With the game tied, 7-7, midway through the first quarter, Tyree Jackson connected with George Rushing on a 37-yard touchdown pass, on fourth down, to give the Bulls a 13-7 lead. Bowling Green crossed midfield on its next possession, before the UB defense made a play that change the course of the entire game. Khalil Hodge jarred the ball loose from Falcon receiver Scott Miller and Brandon Williams scooped up the ball and raced 69 yards for a touchdown to extend the Buffalo lead to 20-7 early in the second quarter. Patterson and Marks each had touchdown runs later in the second quarter to give the Bulls a 34-7 lead at the half. Nursing a big lead, Buffalo worked the clock in the second half. Marks added his second rushing touchdown of the game late in the third quarter and Alex McNulty made his first career field goal, a 21-yarder, in the fourth quarter to make the score 41-7. The Bulls held Bowling Green to 205 yards of total offense, including only 58 yards on the ground. Buffalo forced two turnovers in the game. Besides Williams' fumble return, Tatum Slack added his first career interception. Khalil Hodge led the UB defense with seven tackles, to move into third place in school history with 406 career tackles. He became the fastest player in school history to reach 400 tackles, doing so in only three seasons. "We have an awfully excited group in there and on a Thanksgiving weekend, I just told the team how thankful I was to be their head coach," head coach Lance Liepold said. "They've gone through a lot. They've worked really hard for this opportunity and to win 10 games and play for a championship is pretty special." The 10 wins are a school record for a single season and the 7-1 finish in MAC play is the team's best since joining the conference in 1999. Buffalo will next meet Northern Illinois in the Mid-American Conference Championship Game next Friday at Ford Field. The game will kick off at 7 pm and air on ESPN2. The Bulls will look to repeat history, 10 years after winning the 2008 MAC title.